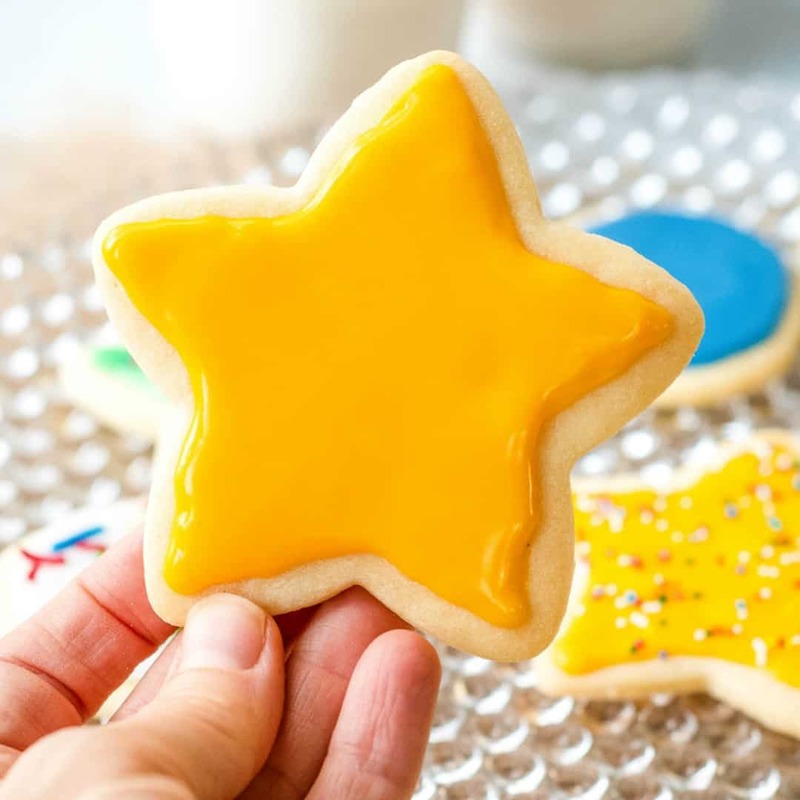 It takes only four ingredients and 5 minutes to make the absolute best cut out Sugar Cookie Icing that hardens to a glossy, shiny surface! Practically every holiday or occasion calls for cut out sugar cookies. Sugar cookie dough can be cut out in a variety of shapes to match different party themes. Whether it’s Christmas, Valentine’s, Halloween, a birthday, graduation, or wedding, there is a cookie cutter to go with it! An essential component of those apropos buttery cookies has the best sugar cookie icing to slather on it. 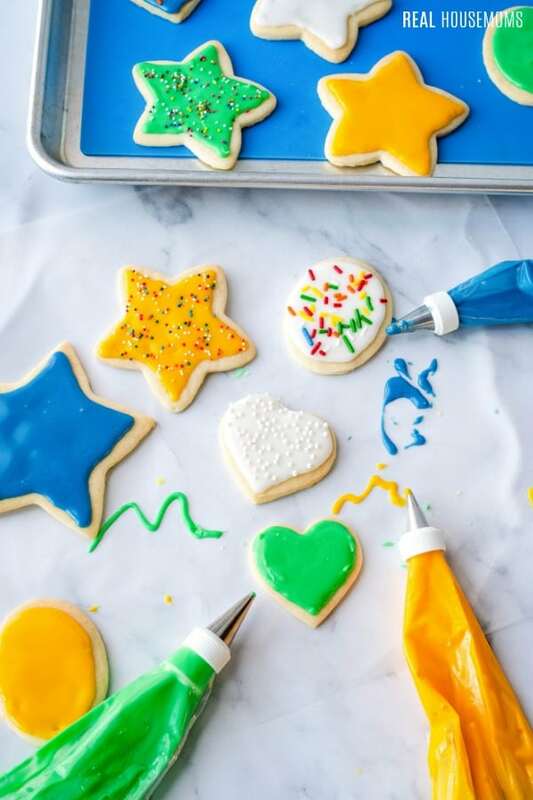 Royal icing for sugar cookies hardens into a glossy, vibrant glaze makes those cookies shine! Like this recipe? Pin it to your COOKIE pinboard! 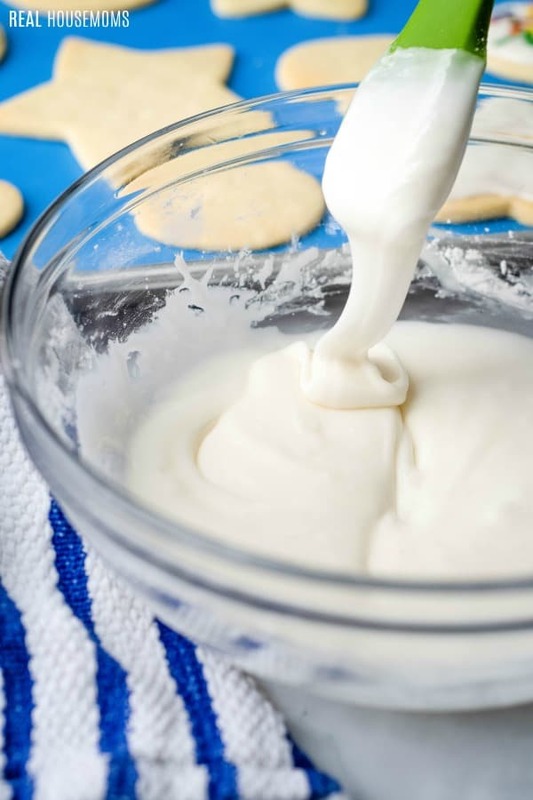 The best Sugar Cookie Icing has been a tried and true recipe in our family for years. Without fail, no class party would go by without my mom’s famous cut out sugar cookies making an appearance. Teachers might have highly requested them, but I think Mom made them year after year because I could be trusted transporting them to school. 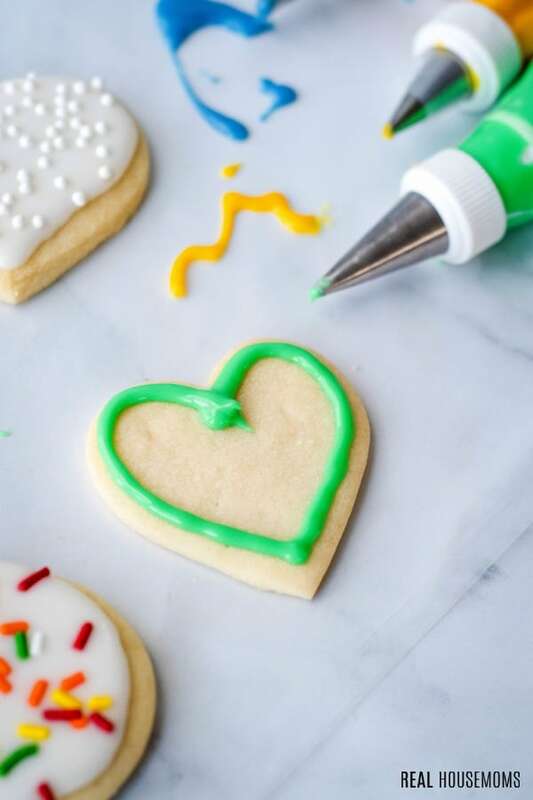 This sugar cookie icing recipe hardens into a beautiful glassy surface that’s durable enough to be stacked, wrapped, or transported on a bumpy bus ride. It’s like a sugar force field for cookies. How Do You Make Cookie Icing That Hardens? The trick to getting sugar cookie icing to harden is in the ingredients, powdered sugar, milk, and corn syrup. The extract adds a boost of flavor. The small amount of corn syrup achieves that shiny, glossy surface. Since there is no butter or fat in the recipe, this icing will harden similar to royal frosting. But, unlike royal frosting, the ingredients are simple, and this frosting impressively is made in only 5 minutes. Sift powder sugar into a bowl. Add corn syrup, extract, and milk. Stir ingredients vigorously until no lumps remain. If making colored icing, divide into bowls and add food coloring. To frost cookies, pipe an outline around the edge of the cookie. Fill in outline with icing. Start with a couple teaspoons less of milk. Add the last 2 teaspoons as necessary. To achieve the perfect consistency add more powdered sugar to thicken and a touch of milk to thin. You’ve reached the correct consistency for frosting if a scoop of icing slowly falls off the spoon. 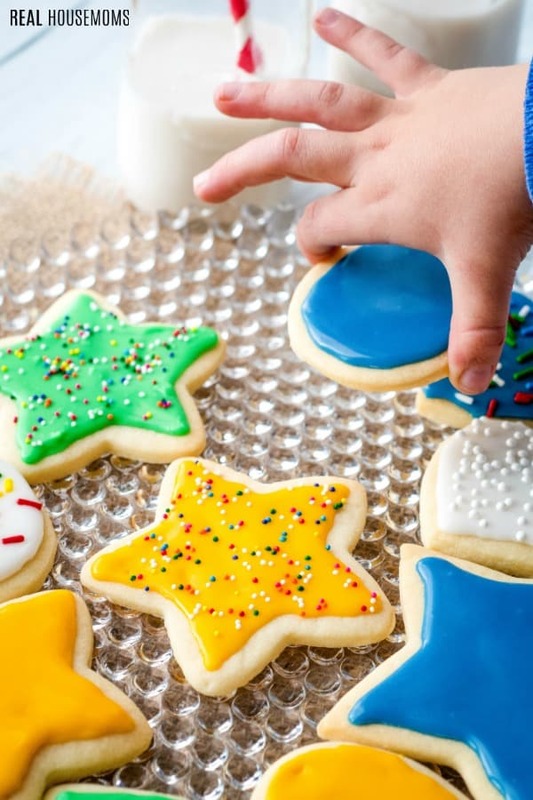 Traditionally sugar cookie icing is flavored with almond or vanilla extract, but orange, lemon, maple, or coconut extracts can also be substituted. Sifting the powder sugar before adding milk will eliminate any potential lumps in the frosting. Pipe an outline of icing and fill in for pristine edges. Alternatively spread it on with a small knife and decorate with sprinkles. This frosting hardens quickly so have sprinkles ready to put on immediately. Before stacking or wrapping cookies, make sure the icing is completely hard. Set cookies on a baking sheet for 12 hours. 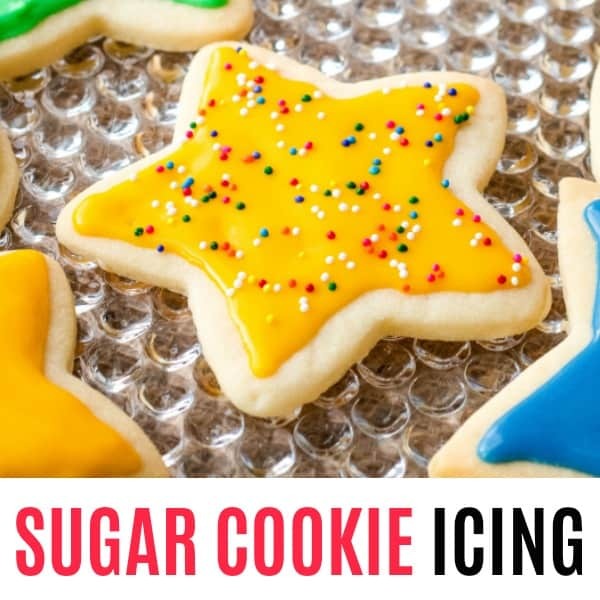 Looking for more amazing sugar cookie recipes? Sift: This sifter makes it easy to blend together ingredients and remove lumps. I love that there is a lid, so I can throw everything in the sifter and set it aside until I’m ready to use it. Medium Bowl: These mixing bowls are perfect for mixing and serving. I love the varied sizes so I always have to right size bowl for all my mixing needs. Food Coloring: This gel-based food coloring makes it easier to color your batters and icing! Piping Bags: Disposable pipings bags handy to have on hand for filling desserts & donuts and food decorating. Pop a coupler and icing tip on your bag or snip off the end and you’re all set! Sift powdered sugar into a medium bowl. Add 6 teaspoons milk, corn syrup, and extract. Stir vigorously until icing is smooth. If needed, add additional milk to thin icing more. You've reached the correct consistency for frosting if a scoop of icing slowly falls off the spoon. If making colored icing, divide into bowls and add food coloring. You've reached the correct consistency for frosting if a scoop of icing slowly falls off the spoon. 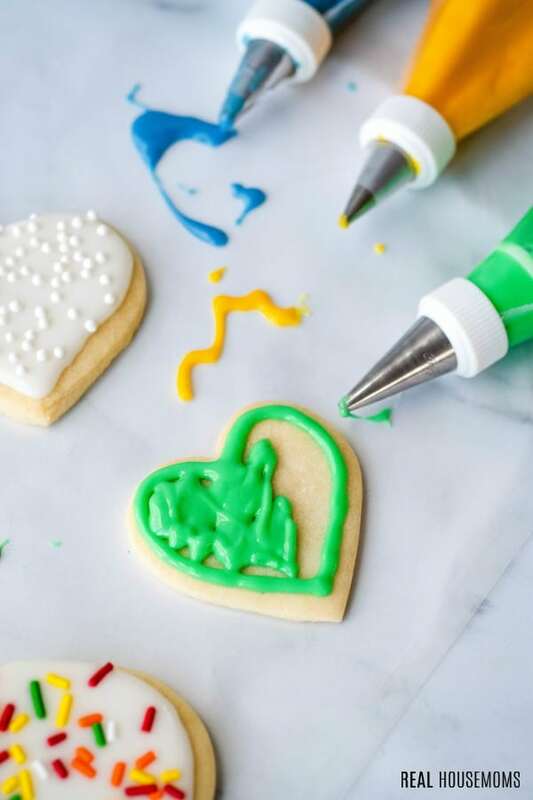 Sugar cookie icing can be piped as an outline and filled in for pristine edges. Alternatively, it can also be spread with a small knife and decorated with sprinkles. My site, MamaGourmand, specializes in how a "foodie feeds a family." I'm a mother of four children who absolutely loves to cook, but is strapped for enough hours in the day. My manageable recipes are tried and true family favorites we all enjoy.